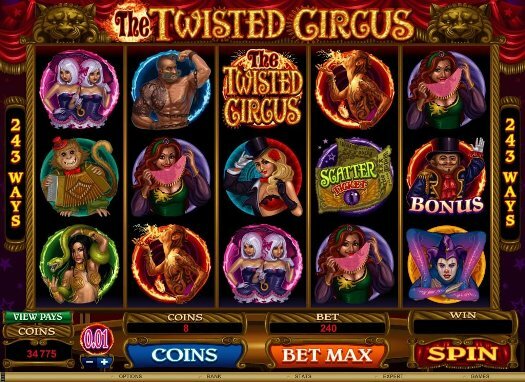 The Twisted Circus really is different from the usual run of slots, presenting a truly off-the-wall theme that provides an amusing backdrop to a genuinely entertaining slot with good prospects for reward. 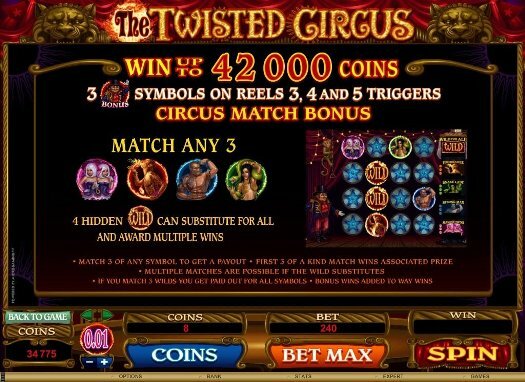 Jackpot City Casino offers an internet slot experience that is strangely out of the ordinary this month as we launch the darkly different new video slot THE TWISTED CIRCUS. This unusual slots theme is wrapped around a smooth-as-silk slot that offers 2 different Wilds, up to 13 retriggering Free Spins with triple Multipliers, a generous interactive Bonus and a valuable Scatter feature. 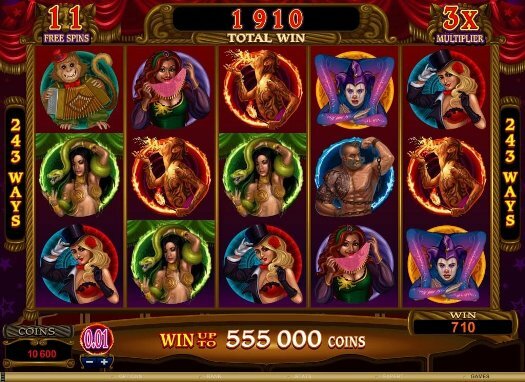 This 5 reel, 243 Ways to Win video slot game has a theme inspired by the weirdly wonderful and endlessly entertaining world of the Big Top...but with some extraordinary characters like the diminutive Ringmaster, the Bearded Lady, fire eaters, a tatted Hercules, snake charmers and a musical monkey, all depicted by outstandingly original graphics in brilliant colours. 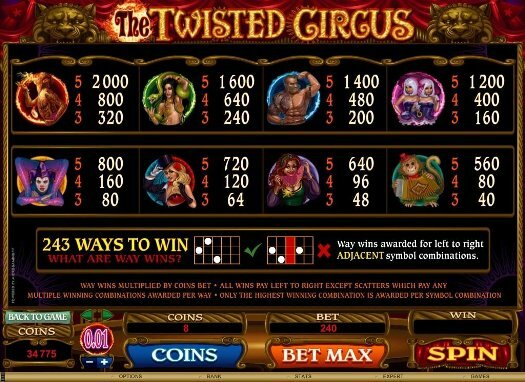 The betting range on The Twisted Circus slot game stretches from 0.01 to 0.30 per way and a payline cost of 30, with a maximum bet of 120.00 That sort of stake can achieve magnificent wins of up to 37,000.00 in the base game and a spine-tingling 110,000.00 on Free Spins. 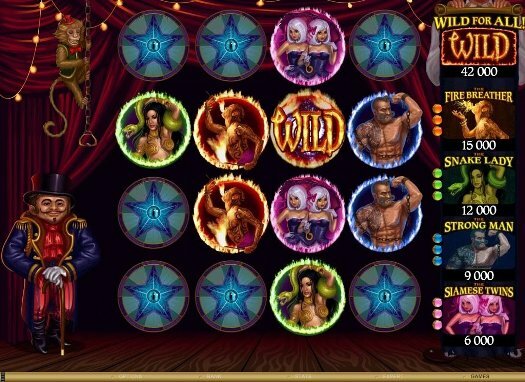 For Free slots spin fans, this game is loaded to the trapeze platform with these win-generating features. Three Scatter Tickets will generate 13 retriggering Free Spins in which all wins are tripled. 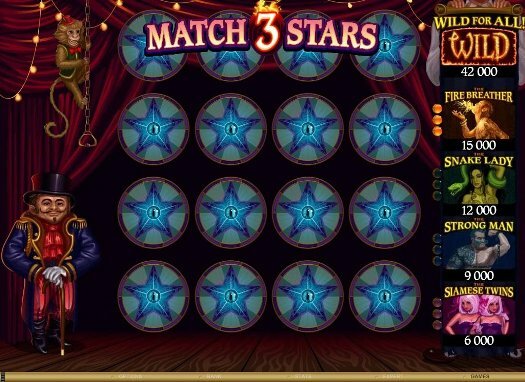 The Ringmaster may be small, but he has a powerful influence on rewards in this absorbing game; three of these symbols across reels 3, 4 and 5 give the player access to the Big Top and entre to the Circus Match Bonus, where the player can win prizes by matching 3 curious characters from the game on a 16 space screen, aided by four flaming Wilds that help in putting together the right combinations. 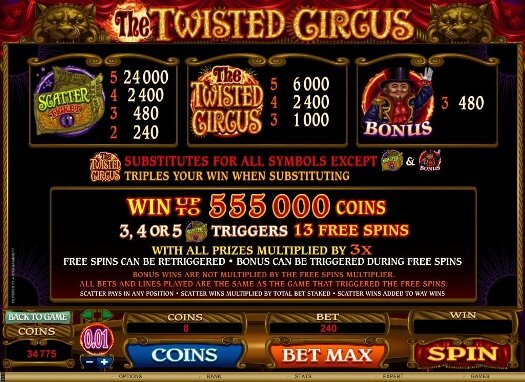 Providing an additional Wild and further opportunities to win is the Twisted Circus logo, which substitutes for all but the Ticket Scatter and the Ringmaster.